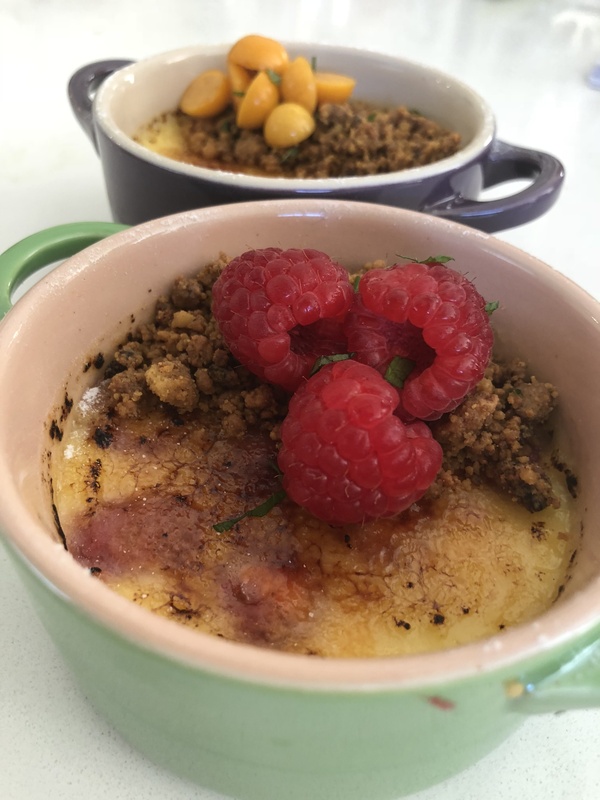 I have a sweet tooth and love dessert.A great recipe is our White Chocolate Berry Crème Brulee with a pistachio crumb. This recipe can be changed to suit your flavours of choice. I make it with raspberries or gooseberries, but this recipe can be adapted to suite you. The basic crème brulee is so delicious you could even serve it plain. Finely chop the pistachios in a food processor until quite fine. Add the flour, sugar and salt and mix until combined. Then add the melted butter and process until the mixture is combined and resembles crumbs. Spread the mixture on a baking sheet and press it down gently with your hands until flattened to around a centimetre in thickness. Bake until it starts to brown at the edges and remove from the oven. Using a good pair of Oven Mitts, remove from oven. Using a spatula turn the biscuit into large pieces to ensure it all browns evenly, and return to the oven for a further 5 to 10 minutes until golden brown. Allow it to cool completely before crumbling it into small pieces in a large Ziploc bag. Place the white chocolate discs on a lined baking tray and place into the same oven. Allow the chocolate to caramelise which can take anything from 5 to 10 minutes depending on your oven. You want the chocolate to go a light brown colour. Once its cooled completely, crumble the mixture and add it to the pistachio crumble and mix until it is well combined. Beat together half the castor sugar (30g) and the egg yolks in a bowl until pale and doubled in volume. Then in a saucepan add the cream, the vanilla pod seeds and the remaining 30g of sugar. Heat the mixture until just before it starts to bubble then remove from the heat. You don’t want to overheat the cream mixture so that a skin forms on it. Stir in the white chocolate discs until melted. To prevent the egg mixture from curdling we are going to temper it by adding a half a ladle at a time of the heated cream mixture to the egg mixture, while stirring with a whisk. Once combined, pour the mixture through a fine sieve into a pouring jug. Place 4 to five halved gooseberries/raspberries at the bottom of the ramekins. Slowly pour the mixture to fill the ramekins to ¾ full. Place the ramekins in a warm water bath and place in the oven to cook for approximately 40 minutes to an hour, depending on the size of the them. Keep your eye on the brulee’s, they are ready to come out when set with a little wobble in the centre. Allow to cool further and refrigerate until ready to serve. For a crisp glaze, first dust the top of the cooled and set brulee with some castor sugar and using a blowtorch, caramelise the sugar topping until golden and crisp. Once cooled and set, cover half the crème brulee with the pistachio and caramelised white chocolate crumble. Then place the halved gooseberries/raspberries and some finely sliced mint on the other half.